“Mr. 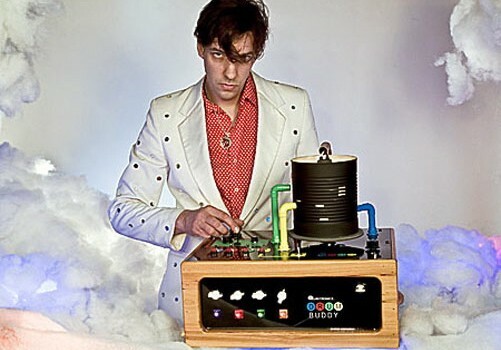 QUINTRON is a concert and nightclub organist from New Orleans, Louisianna. He plays a type of music the press has dubbed “Swamp Tech” on a custom Hammond / Rhodes combo organ which has been built up to look like a classic muscle car with actual working headlights. All this organ noise is backed by irresistibly raw drum machine beats (think 8 bit Booty-Bounce chanelled thru the hands of a Troglodyte) and his own patented invention THE DRUM BUDDY – a rotating, light-activated analog synthesizer which is played much in the same way that a DJ spins and scratches records. Celebrity Drum Buddy owners include LAURIE ANDERSON and NELS CLINE of Wilco. Much of Quintron’s music is driving, hypnotic Sixties dance music a’la the Seeds or Standells. However, don’t mistake Quintron for being totally squaresville retro. He has benefited from 40 extra years of music history to develop his own richer style and borrowed from a number of other genres to become…well, Quintron. But he has faithfully retained that Sixties garage essence, a precarious balance between wholesomeness and worldliness that fell apart after the Summer of Love. Quintron’s permanent collaborator is none other than master puppeteer, MISS PUSSYCAT who plays maracas and sings, as well as entertaining all age groups with her highly amusing technicolor puppet shows. Hers are complex puppet shows beautifully crafted for success in intimate venues of late night rock and roll drinking and dancing: tactile, idiosyncratic puppet characters, pithy dialogue, electronically pixilated soundtracks, and charming black light effects create a visual and engaging overture/finale to Quintron and Miss Pussycat’s music sets. Quintron aids in puppet manipulation and voicing. Miss Pussycat, in turn, sings lead and back-up with a steady maraca beat during Quintron’s performances.